Sports Time Radio has asked me to help everyone prepare for the 2013 season of Fantasy Football. I am going to release each week a mock draft. Our mock draft will be a 20 team mock draft and is a PPR league. I will release rounds 1-5. Then based on what has transpired in preseason I will adjust my rankings and redraft each week. Before I release this week’s mock draft I want to update everyone on key injuries that will affect your draft. 3) Percy Harvin – Looks like surgery but the time table is not clear. I think it will be significant part of the season. Monitor this closely. He currently has been taken off my board until I see he can play this year. 4) Ben Roethlisberger – Soreness on in his surgically repaired right knee. Nobody has called this a setback, but it is worth watching. He has not fallen on my board yet. He remains number 14 on my board of fantasy QBs. Round one is dominated by running backs. If you draft at the top of your draft the only decision you need to make is what running back you will take. This is the deepest QB draft I can remember, so you can wait a little on this position. I do feel the top three QBs are worth taking in the middle to late first round. Last year Calvin Johnson and Brandon Marshall scored as many points as the elite running backs did. These two wide receivers are worth taking in the top 10. I will release round two on Monday 7/29. My First ever NBA game and of course it’s a Bulls game. I could have only wished as a kid to go. 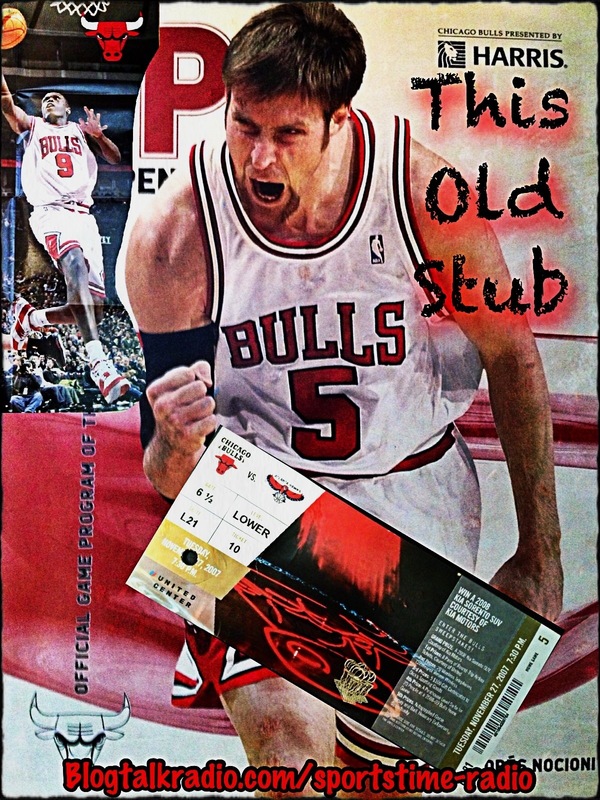 I had friends that had gone to Bulls games during the dynasty. One of my friends even went to the playoffs against the Lakers and at 12 years old, his dad bought him a tee shirt that said with asterisks F**k LA. He wore it once to the roller rink and we were told to leave, so we walked down to the sports card store and hung out there till our ride came to get us. Anyways, I get a call from my cousin, “Hey you want to go to a Bulks game?” I told him I had no money and he told me no worries. He had free tickets from his mom who got them from work. Not only are they free but they are in a suite. Now not a bad way to go to my first basketball game, but it did spoil me. The free tickets also included premium parking. Free tickets for a suite and free parking, hopefully there’s free food also. There was but let’s just say it was free so I’m not complaining. Once we arrived to the suite level, I swear if you wanted, you could just walk into any other suite if you felt like it. Now you walk in and first thing I see is a private bathroom and coat closet. Small details but makes me feel like I’m spoiled. Once you turn the corner there’s a small kitchen, mainly with a sink mini fridge and top cabinets that your not supposed to go in but hey you shouldn’t have it unlocked if you don’t want me to open it. A small buffet table is set up with fancy platters but the food inside not so fancy. There was a small lounge but to get to the seating through the glass door and there’s three rows of seating. Sit where you want, so of course, I go straight to the front. I immediately notice that our section is directly behind the cheerleaders. So all game the minute a Pom Pom shakes my eyes are off the court and on them. I’ll be honest with everything being free including the beer and I’m not driving so who cares and that’s why I don’t remember too much about my first Bulls game. I do know it was a blast and I couldn’t have asked for a better time, especially when the desert cart showed up. Now apparently you were only supposed to take one desert but no one told me that. I picked the biggest brownie Sunday and took a large fancy chocolate chip cookie. I encourage my cousins to do the same. Desert was great, the game was great everything was great about this game. Couldn’t have asked for a better time, thanks SuperBad (my cousin). I do plan on going this Easter, so should put together a much better blog about my experience, Rose probably wont be back and they might not be that great but I’m expecting to still have great time.